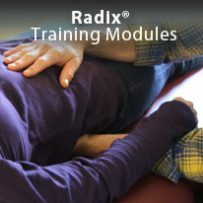 Training in the Radix Approach is offered in a modular format. Training workshops are 5-6 day intensive workshops. Module 1 is an introduction to the theory and practice of Radix, and it’s historical roots in the work of Wilhelm Reich. Participants will learn practical skills that can be applied to traditional verbal therapy or skills that will complement other somatic trainings. Module 1 provides a good grounding for the other training workshops & is recommended before attending further modules. It is open to mental and physical health practitioners who work with people to promote healing and personal growth, as well as to those who wish to deepen their own personal growth through a body-centered modality.